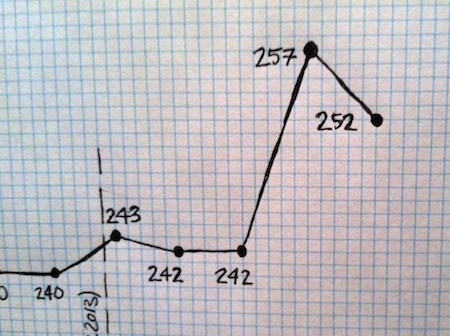 Early Weigh-In Results and Produce Haul | Keep It Up, David! Very exciting news. It wasn’t a complete surprise, since I’ve weighed myself a couple times over the past few weeks to see how I’m doing, but I’m still elated, especially since this month was a challenge, what with my surgery and my inability to exercise afterwards (I’m still not able to fully exercise, but I am walking a lot). I still have 10 pounds to go before I lose the 15 that I gained when I fell off the wagon, but I’m getting there! This puts my weight at 252 pounds. That’s a 150-pound loss from my all-time high of 402 pounds. I have a few more photos to share – a produce haul from the supermarket! I got back from my trip to Colorado to a kitchen completely devoid of fresh produce. It was a calculated move on my part – I bought just enough food before Colorado to last me, without having to risk anything spoiling while I was out of town. Now I was in desperate need of fruits and veggies, so I headed to the store. A lot of thought of consideration went into this shopping excursion, because I only need enough food for 5 days. Next week, I’m heading out of town again – and this time for over 2 weeks – so I needed enough food to get me through, without buying too much and throwing stuff away. 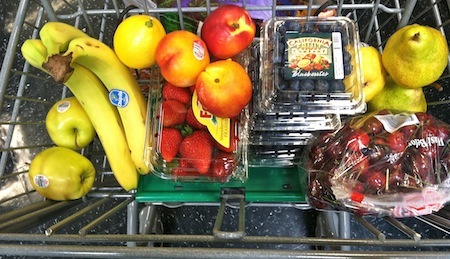 Apples, bananas, a lemon, nectarines, strawberries, blueberries, pears, and cherries. The cherries were on sale for $1.88 a pound (a GREAT price), and the blueberries were 4 cartons for $5 (another GREAT price), so I couldn’t resist. The plan is to eat the non-berry items first, because I know I can always freeze the berries if I don’t get to them. 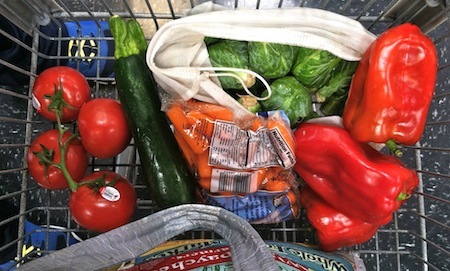 Tomatoes, zucchini, carrots, brussel sprouts, and red bell peppers (which were 3 for $1 – amazing!). Carrots are hearty and will probably last through my trip if I don’t get to them, so the plan is to eat those last. If you’re a long-time reader of the blog, than you’ll know my love for oddly-colored vegetables (here’s proof, proof, and more proof). 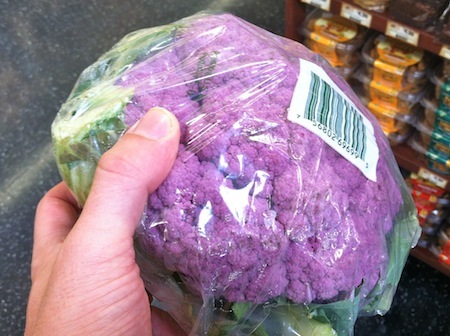 The store had beautiful purple and orange cauliflower, and I was so tempted, but I ended up passing, because I just didn’t think I could eat it in time. This entry was posted on Thursday, May 30th, 2013 at 9:49 am and is filed under Uncategorized. You can follow any responses to this entry through the RSS 2.0 feed. You can leave a response, or trackback from your own site. Have you ever made mashed cauli? Like mashed potatoes? Wondering if you could freeze it? Or if it would be watery when thawed? Thank you for being my motivation. If you can do it, I can do it! Congrats on your weight loss not only the 5 lbs but on what you previously lost. It’s such an inspiration to know if you fall off the “wagon” it’s always waiting for you to hop on. I’ve lost 65 lbs on my journey through WW and I admire all that you have done and God Bless Richard Simmons. Great job, David! P.S., the sauce is a fabulous hit! I have had it three times this week, once on top of pasta, and the other two times on a bed of spinach and roasted brussel sprouts, and the other on top of spinach, roasted brussel sprouts and grilled eggplant. Reen that is good to hear as I’m making the sauce up for dinner tonight. I’ll be using it on Spaghetti Squash! And thank you David for including the sauce in your blog. I saw you on TV and that is what inspired me to check out your site.